After introducing Android 4.0 in October of last year, phones and tablets are finally seeing the version of Google’s(s goog) mobile platform through upgrades and new devices According to Google’s own developer dashboard, 16.7 percent of the phones and tablets that accessed the Google Play store in the last two weeks of July are running Android 4.0 or a later version. Carriers are finally getting the updates out to devices and most new handsets that debuted this year come with this version of the software. 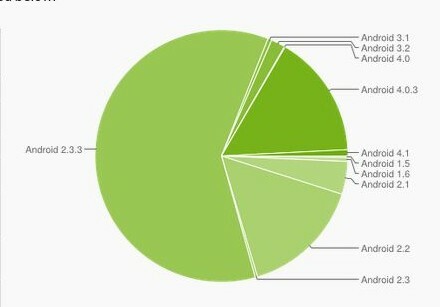 At this point then, 15.9 percent of devices have 4.0, or Ice Cream Sandwich, while 0.8 percent have 4.1; the software known as Jelly Bean. That’s telling because the 4.1 devices would mostly be comprised of the Galaxy Nexus and Nexus S smartphones — both of which have seen the upgrade — and Google’s new tablet, the Nexus 7. While sales figures for the Nexus 7 haven’t been released, this data supports the idea that the 7-inch tablet is selling well. Last month, Google had to stop taking orders for the 16 GB version of the Nexus 7 due to an underestimation of demand. Through the rest of this year, I’d expect Android 4.0 to ramp up quickly; perhaps accounting for 40 percent or more of all Android devices. Jelly Bean, or Android 4.1, will surely take more time because of the software integration efforts needed by handset makers and the testing and tweaking made by carriers. But it will be interesting to watch the Android 4.1 adoption rate during that time as it may say more about Nexus 7 sales as well as the small slate market as a whole. This is one of the reasons I’m an iPhone user – when a new OS comes out, I’m instantly able to update. When will Android Ice Cream Sandwich come to Xperia U? A little backwards. The JB update will probably go faster. It was ICS that was a major change and proved to be a task to get it ready for phones. JB is smaller easier jump. Good point, Phil. My thought was based on the work handset makers have already done for Android 4.0 integration. While it may not take much more effort to add or push 4.1, more devices will be selling with Android 4.0 and getting the 4.0 upgrade than those with 4.1 is what I’m thinking. Either way, it’s good news for Android phone and tablet owners!